So, we were a quit peaceable couple. I can’t even remember a serious argument through our engagement. But, here we are in Rome at the Pantheon and we want to go to this little gelato shop the guidebook recommended. We pull out the map that had been given us at the hotel. The Gelato Shop is just a few blocks behind the little Pantheon symbol on the map. We start debating the fastest route around the Pantheon in front of us. Right or left. The debating leads to an argument. We must have gone two miles and were looking at where the shop should be on the map. I’m thinking they couldn’t have gotten the map scale that wrong. Then we run into a river (Tiber) that wasn’t even on the map! It is only then we realize the “problem”. THE MAP WAS UPSIDE DOWN! Whoever designed the map had put the little Pantheon icon upside down! If you’ve been walking further than you think you should in order to reach your destination… Perhaps the problem is with the mental map you’re using. You’re working hard, you haven’t given up – but just can’t seem to reach the destination. Sometimes we have to stop walking. Stop struggling. More action may just be taking us further away. What we need to do is take our maps and assumptions and re-examine them. Perhaps the object we desire is in the opposite direction we’ve been walking. P.S. Yes… We walked the 2 miles back, got that @#%*! gelato and have been happily married for 15 years. If you are trying to create breakthrough success by working harder and harder — for more and more hours, or by trying to achieve ‘insane productivity’ — you may be missing out on golden opportunities to leap your success to the next level. Let me be blunt: I’ve had the good fortune of helping a number of entrepreneurs create million-dollar (and multi-million dollar) breakthroughs and not one of their breakthroughs came from productivity, time-management or working harder and harder. 80% of people’s time and effort and struggle to create more success is focused on doing things that are not responsible for the big breakthroughs. In fact, there’s a good chance that a lot of the advice you’ve received has taken you FARTHER away from the chance of a breakthrough success! Think of it this way: Hard work and productivity are both important and to be admired — but they are not sufficient to create breakthrough success. For example; one founder and his team were working their tails off during their first year and just couldn’t break the $1 Million barrier. Then, with a bit of searching, we found their success multiplier and shot the business to $7 Million over the next 2 years. They weren’t 700% more productive or working 7X harder… They were enjoying the power of a success multiplier. Another was stuck at the $6 Million level. He and his team were as productive as any team on planet earth. Then I helped them discover their success multiplier and their sales climbed to $25 million. 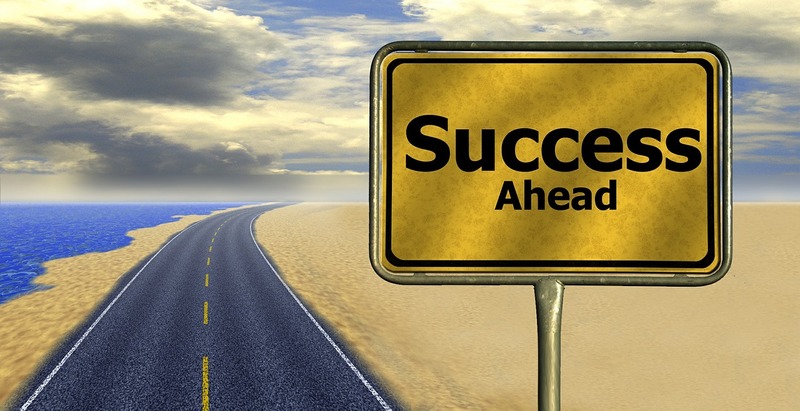 So, what’s a "Success Multiplier" and how do you find yours? I had written a book on Business Strategy. It was time to write another book. I chose Business Growth as my topic. And off I went interviewing INC 500 and other fast-growth CEOs. During the interviews I was getting lots of the platitudes on running and growing a business that both you and I have heard before: "Be good to employees,” "Customer Service,” "Set Goals,” "Hard Work,” "Give 110%,” "Get up when your knocked down,” "Don’t quit,” etc., etc.. I started with their big breakthrough. One guy was running a $5 million business with only 1.5 employees. Another had sold his business for $100 million and had just launched another that was rocketing upward, another went from renting bounce houses to being one of top 3 entertainment rental companies in Southern California in just 2 years. Then I went backwards… "What happened right before these big results?" "Now What happened before that?" And so on. As I did this, a very consistent pattern or process emerged. There were 6 very common steps each of these breakthrough entrepreneurs went through to achieve their extraordinary results. Further, one of the steps was far, far more important than all the other steps (even though you need all the steps to get the results). For one entrepreneur working out of his garage on weekends … It was a box of used cell phones. The Success Multiplier that box of phones revealed allowed them to rocket to $7 million in revenue and grow 1800% faster than their competitors on INC 500 list. Yes, one box of used cell phones triggered this success (I explain in depth on my "Success Multipliers" workshop). 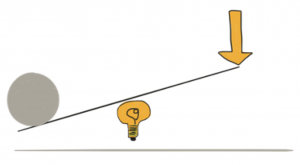 So, what’s a Success Multiplier? A Success Multiplier is an insight or fact or possibility in their industry, market, customers, products, advertising, sales processes, etc.. When harnessed, these Success Multipliers catapult the business forward far beyond the effort expended. It’s like a giant lever which multiplies their time, efforts and money 10Xs. I want to share these 6 simple steps with you so you can avoid the unnecessary pain and struggle in creating success, moving up in your career, or growing a successful business. I want to help you get the success you desire faster – whether that means a certain income level, or overcoming tough competition or selling your business for many millions. So, in the next few weeks I’ll be putting on a live Success Multiplier Workshop If that sounds interesting, just comment below “I’m in” and I’ll give you a heads up when I’ll be giving the workshop. At the end of our time on the Workshop you’ll have a method you can use for the rest of your life to create extraordinary results in your business and life. Breakthrough-Success-Formula from Robert Stover on Vimeo. Here’s the 6 step “Breakthrough Formula” I use to help entrepreneurs create million dollar ideas. If you want to grow your results, this may be one of the most simple and effective tactics you learn for multiplying your results. Before there is influence — there must be receptivity. Before a farmer plants a field, he first tills the ground and prepares it to receive the seed. And if you want to influence (people) anyone to do anything, you’ll have a lot more success if you first create receptivity. 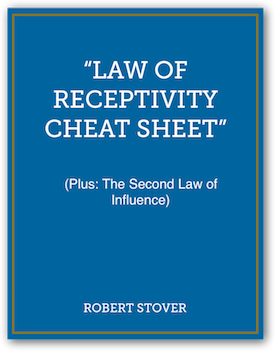 So, how do you create receptivity in the mind of the people you want to influence? There are a number of ways, but; I’m going to show you how to lower resistance and increase receptivity in 10 seconds using a few key words. Don’t let the simplicity of this simple stratagem fool you. Don’t discount its power just because it is easy. I’ve used this technique to create a joint venture that exceeded $3 million dollars. I’ve taught it to the teams of nationally known coaching operations. I’ve taught it to the poor men and women who have to cold call people everyday. And I’ve used it inside of webinars, advertisements, sales letters, lead-gen letters and major presentations. It’s almost magic in its ability to instantly reduce the pressure, stress and tension from most influence situations. There’s nothing sneaky, manipulative or underhanded about it. It’s not something you are “doing to” people. In fact, people will both like and respect you more. To understand why this simple strategy is so effective, you first have to understand how people’s minds naturally work. Fact #1: No one likes to think they are being influenced or persuaded. The minute we think someone is going to try and sell us a product, an idea, or lay a heaping pile of work on us, our guard goes up. We get ready to resist. Daily you and I are bombarded by thousands of attempts at influence. Ads all over Facebook, bill boards, gmail … spam in our inbox, people asking “small favors”, sales people asking “If there were a way I could X you’d be interested, right?”. Is it any wonder that our mental guard goes up the second we perceive anyone is going to try and influence or persuade us to do even the smallest thing? Fact #2: People like to feel in control. You and I, deep inside, like to be in control. We like to control our destiny, our time, our money. Anything that we perceive as taking control away from us we start to resist. It’s an unconscious instinct. Have you seen that study that shows that if people think someone is waiting for them to get into their car and leave a parking spot they actually take longer?! Put those two facts together and you get RESISTANCE. In many cases it is unconscious. 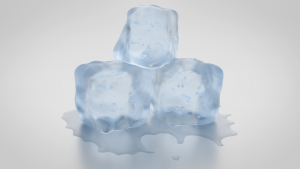 But when we perceive we are about to be influenced we immediately begin to experience inner tension and resist. So, if we want to influence people, we need to find a way to reduce this resistance. Immediately, before we ever present a plan, give an idea in a meeting or make any attempt at persuasion. Let’s say you are at a park. You decide that you want to feed one of the squirrels a nut. Is the nut good for the squirrel? Yes. Just like your ideas and plans and products or services would be of benefit to other people. Will the squirrel enjoy eating the nut? Of course. But what will happen if you hold that nut in your hand and then charge the squirrel in a frontal attack? It’s going to run right up the nearest tree. Right? You must make it safe for the squirrel to sample the nut. First you hold the nut a good distance from your body. You may pretend to not even be looking at the squirrel. The squirrel is curious, the nut smells good. It looks good. The squirrel inches forward. But it is still ready to run the minute you make a move in its direction. Next, you let your little friend start to nibble and sample the nut. Slowly you can begin to pull the nut in a little closer to your body. Then you carefully pull out another nut. 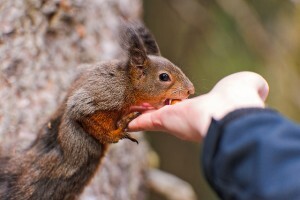 Soon you find the squirrel is boldly eating out of your hand. The exact same thing happens when you influence others. Snap! The person’s guard goes right up. That’s the opposite of what you want to happen. What can we do to disarm the people, create receptivity? How can we put them at ease? There are two techniques for doing this. First, you signal to them that you are not going to charge them in a frontal sales attack. Second, you put them in control. And you do it in the first 10 seconds. Instead of force or enthusiasm or big promises and hype, use what I call the “maybe, maybe not” approach to put people at ease. Hand the control to them. Do you hear how this natural influence approach puts people at ease? Very, very rarely does a person ever hear anyone admit that their ideas, products, plans, services may not be a fit. Also try non threatening, non specific phrases like, “open a dialogue”, “see if its a fit”, “explore your situation”, “kick the tires”, etc. I’ve got a colleague who’s a deal maker. He uses a very similar technique when he’s throwing out “The Big Idea”. His potential partners (with big egos) don’t feel threatened. He’s all but told them he’s probably wrong up front. There is no pressure for people to react to. So, like our squirrel, they start nibbling on the idea. Notice how by using these types of phrases you haven’t put people in a position where they have to resist or put up defenses. Christopher Carpenter at Western Illinois University studied a very similar technique to the Maybe – Maybe not – Choice is yours method I’ve shared. He conducted a meta-analysis of 42 different studies with more than 22,000 participants using the phrase, “But You Are Free…” (BYAF) compliance gaining technique. This technique operates by telling the target that he or she is free to refuse the request you are making. How powerful is telling people, “But you are free to say no.”? In most cases it DOUBLED the number of yeses. Further, in both situations of bumming some spare change off a stranger and in fundraising activities it DOUBLED the amount people would donate. Both this technique and the “Maybe – Maybe Not” approach keep people in control of their own freedom. 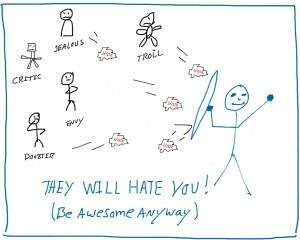 Ironically, many sales organizations have heart attacks when I mention this method to their sales teams. How dare one give a prospective customer the option of saying “No”. Or admit that maybe, just maybe something may not be a perfect fit. Yet in the real world – and in university research test, this method is extraordinarily effective. Many people who try it are surprised that it not only takes the pressure off other people — it takes the pressure off of them. 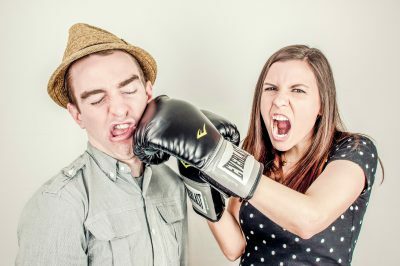 They are able to confidently make some pretty bold proposals because they know the other person isn’t going to think of them as pushy or manipulative. Even more incredibly, this Maybe-Maybe Not method works across context. It works in personal conversations, management and leadership scenarios, face-to-face sales and phone work, email marketing, direct mail, email, lead gen, and video sales letters. You sound like someone they can trust. Because you spoke the truth! Do you see how you are sowing the seeds of trust and respect in the first 10 seconds? I’ve got a lot more of these “Natural Influence” secrets to share with you. 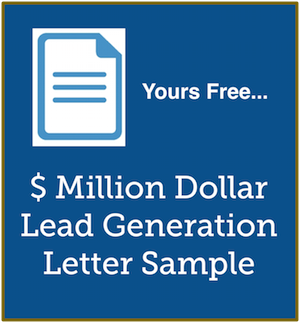 Here’s a million dollar lead generation letter sample for you to download, study and “swipe” from if you so desire. All this week Dave Kirby over at 1SimpleThing has been posting an extensive interview he did with me around my research into how leaders create game change results and success in their businesses and life. Here are the links to those interviews, I’ve put a brief description in each so you can go to the ones that interest you the most. You can listen to the interviews right in the posts, or via iTunes podcasting. He’s got lots of great interviews with a lot of experts, all broken down into the 1-Simple-Thing ideas and actions. Definitely worth your time to cruise his site once you are out there. I’m just crushed,” she said. I was talking with a woman who was crushed that so many people were opting out of her mailing list once she began to email more. These were people who double opted in, got free stuff, then turned around and unsubscribed. Others wrote nasty notes on the way out. 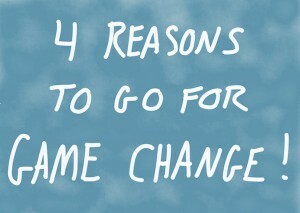 Tthere are 4 advantages that leaders who strive for game change achieve that their competitors and peers don’t..
A game change is not increasing your sales or profits 10% year over year. It’s not just surviving. It’s not growing along with the rest of your market. It’s not being happy with far, far less than both you and your business are capable of. And a game change isn’t working harder and harder to achieve smaller and smaller gains in sales, growth and profits. Number Two: I can give you examples of game changes that my clients have created.